This past Saturday, we took the two hour trek to Valle de Guadalupe in Baja California, Mexico, enjoying a leisurely and breathtaking drive that rivals the northern California Highway 101 in beauty. Our trip was planned around a six-course winter bounty feast at Deckman's En El Mogor, an al fresco restaurant from Michelin-star-studded chef Drew Deckman. After an other-worldly meal, we stayed nearby at the charming Hotel Boutique, and the following morning enjoyed a most amazing breakfast at its in-house restaurant, Fuego Restaurant and Lounge. It was a wonderful 24 hour stay in one of our favorite regions of the world. 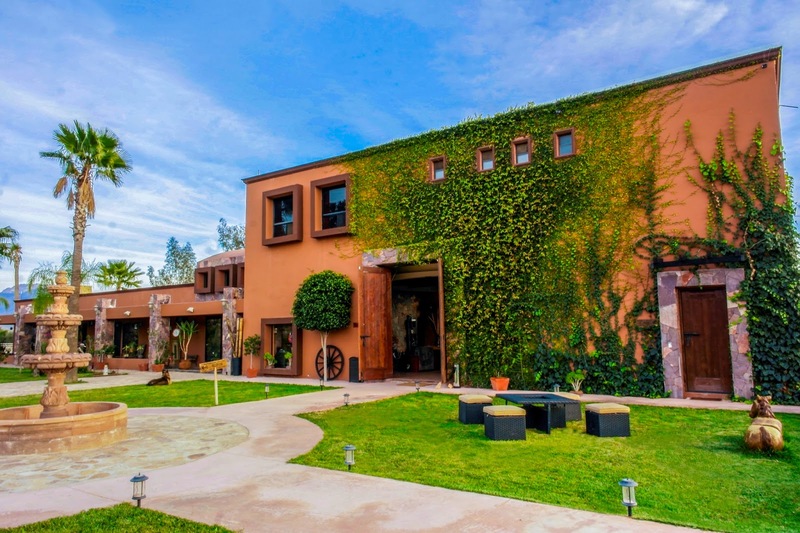 Valle de Guadalupe is poised to become the Napa Valley of Mexico. Wineries are plentiful, well-marked and often include an unpretentious fine dining restaurant on premises. We love taking the short trip to this region, making a few stops along the way (can never pass up a quick pit stop for tacos in Rosarito! 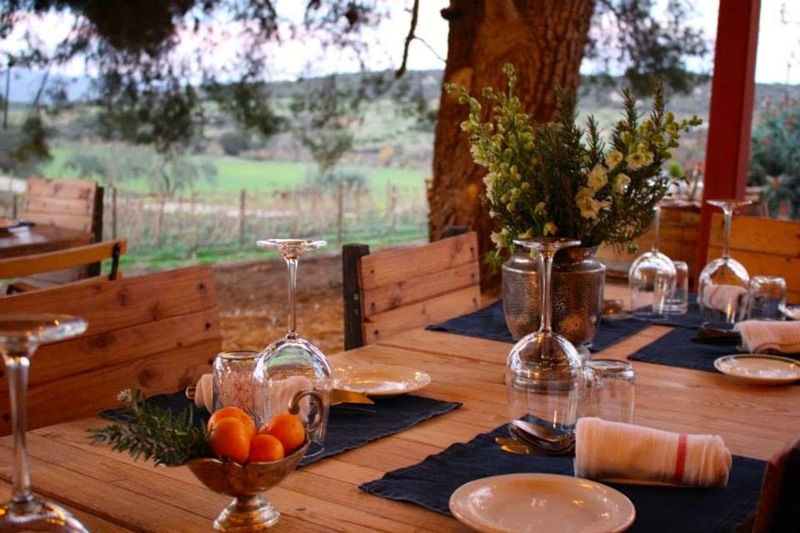 ), then unwinding with the simple pleasures of great food and fine wine in the Valle. It was our first time accessing the recently reopened toll road and we enjoyed expansive views of the Pacific, followed by winding paths through the beautiful, mountainous vistas as we entered Mexican wine country. As we pulled up to the Valle's highest occupancy resort and checked in to our stylish room overlooking the adjacent vineyards, we were warmly welcomed by the gorgeous grounds of Hotel Boutique. Deckman's en el Mogor exemplifies the old world, rustic charm and casual elegance that the Valle exudes - a comforting outdoor eatery (boasting a new makeshift hay-walled dining room for the cooler months) where one can watch Deckman and his staff prepare meals right from his open air kitchen while overlooking the sprawling vineyards of El Mogor winery. At the cost of $100 per person, the Winter Bounty meal was an amazing start to 2015, Deckman's first full year open in the Valle. Deckman's en el Mogor will continue Saturday service throughout the winter and spring of 2015, offering frequent guest chefs and prix fixe meals until the eatery opens full time in May. 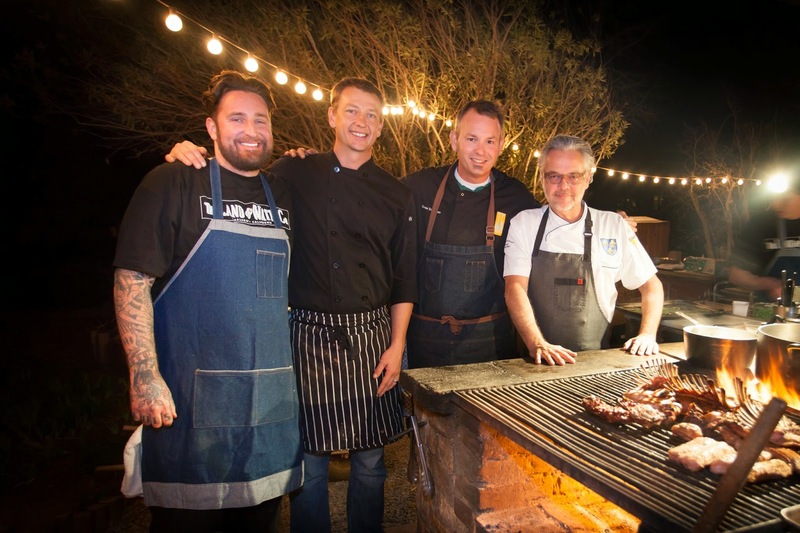 Along with Deckman, several other notable chefs assisted in preparing dinner for the nearly 50 attendees, including Andrew Spurgin of Bespoke Event Styling and Menu Design, Rob Ruiz of The Land & Water Co. and Ryan Steyn of El Jardin restaurant at Adobe Guadalupe. The Winter Bounty feast began with a cocktail reception that included fresh Baja oysters topped with flying fish roe, tray-passed offerings of a most delicious braised rabbit and wine and beer samples. After slurping down some bivalves and mingling with other attendees, guests were ushered to their seats as the ceremonious supper began with a salute by Chef Drew. As a symbolic launch to the first full year of service, Deckman and his wife cracked a bottle of wine on the support beam of the new hay bale dining room. Our first course was a half moon scallop crudo with radish, cilantro flower, turnip green and fresh uni - a refreshing start to what would be a flavor roller coaster of a meal. Although sea urchin roe is not usually my favorite ingredient, it added to the profile of both the first and second course and enhanced my appreciation of this increasingly popular seafood. Course #2 was introduced by Chef Rob Ruiz - a confit bacon lardon with braised daikon, uni with black lava salt, cilantro and the Japanese mint, perilla. The combination of salty pork with creamy uni and sweet daikon was fantastic both in taste and contrasting texture. Next up was Chef Andrew Spurgin's melding of Japanese and French culinary styles with his bone broth consume/dashi. This dish was an absolute work of art that was packed with complex flavors - a slice of fresh caught Baja yellowtail, a grilled Manilla Clam, black charcoal gnocchi, beech mushrooms, pink turnip, red watercress and serrano pepper - all forming a bouquet that was only enhanced by a most delicate broth. Our fourth course came as an exciting kaleidoscope of beautiful colors. Tender wood fired grilled octopus, poblano chile chimichurri, kalamata olives, chorizo and fresh herbs made this a sensational plate. The last savory course was a suckling pig plate served family style. We all picked at different parts of the super moist meat, gathered up some grilled veggies, spooned up the white beans and began to sink into the beginnings of a satisfying food coma. To finish off a superb supper, we were offered a salted Mexican chocolate ganache with vanilla ice cream - a rich and comforting end to a memorable evening. We said our goodbyes to fellow guests-turned-friends, thanked our chef hosts and made our way back to Hotel Boutique for some much needed rest after all that food and never-ending wine. As if we were even ready to start eating again after that feast, we were summoned early Sunday morning to experience an eclectic 3-course breakfast from Hotel Boutique's Fuego restaurant. Fortunately, the meal started light enough with a cous-cous, spinach, avocado, cucumber and red pepper salad. Our next breakfast course was not as light - an ample portion of Chilaquiles in a mini cast iron pan topped with crumbled goat cheese, sour cream, onion and cilantro. I don't want to demonstrate my inexperience in Mexican breakfast, but this was my first Chilaquiles and I loved it, although I craved the addition of a fried egg. Man, do I wish there had been more room in my belly when our third breakfast came to the table, because it was awesome. At first glance, everyone thought it was French toast-type creation, but lo and behold, it was the absolute opposite of that - a garlicky toast topped with phenomenal pork belly, drenched in a creamy cheese sauce, finished with charred chives and sided with marinated tomatoes. I've vowed to return to Hotel Boutique hungry and ready to eat. 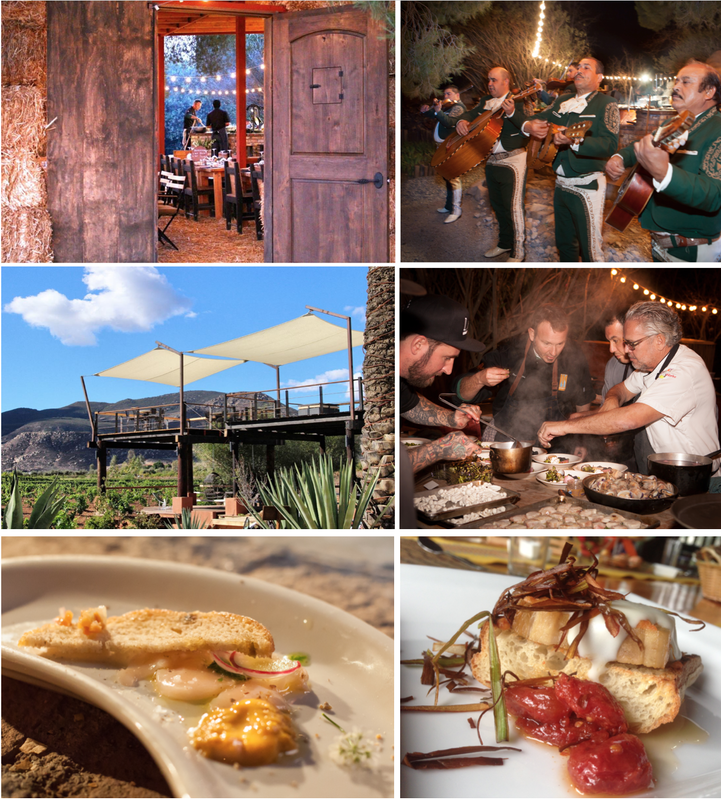 Unless you've been hiding under a rock, you know that Baja California is experiencing a cultural and culinary renaissance, headed by positive influences in Tijuana, Ensenada and Valle de Guadalupe. The Mexican wine country of Valle de Guadalupe is a serene place to unwind and experience Baja's top epicurean delights. All too often we hear people express reluctance to visit Baja stating safety concerns evidently based on media and government propaganda, which very much pains me and are in direct contrast to all of the amazing experiences I've had in Mexico. My partner and I have, literally, driven the entire east and west coast of Mexico and we visit the Baja peninsula often, with nothing but a cursory knowledge of the Spanish language, and we have really never felt unsafe. Throw unreasonable caution to the wind and make it a point to visit Baja California.